Home > eBooks > Social Science > General > A New Industrial Future? 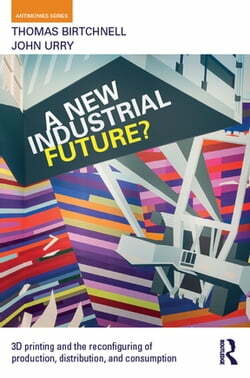 A New Industrial Future? examines whether a further industrial revolution is taking place around the world. In this compelling book Birtchnell and Urry examine such a new possible future involving the mass adoption of 3D printing. The locating of 3D printers in homes, offices, stores and workshops... read more would disrupt existing systems and pose novel challenges for incumbents. The book drawing upon expert interviews, scenario workshops and various case studies assesses the potential future of global manufacturing, freight transport, world trade and land use. It offers the first　book-length social scientific analysis of the character and impacts of a new system of manufacturing that is in formation. The book will be of interest to urban planners, policy makers, social scientists, futurologists, economists, as well as general readers by offering inquiry on this future upheaval in the means of production.